The organization called “2 Million Dogs,” located at 1902 Evelyn Ave., strives to find a cure for cancer in cats, dogs and humans through fundraising and awareness. The concept of 2 Million Dogs was created when dog lover Luke Robinson of Texas and his two great Pyrenees, Hudson and Murphy, began a memorial walk across the country. Robinson stopped along the way to educate pet owners on the warning signs of canine cancer. Robinson had a vision of two million dogs walking two miles simultaneously to raise awareness of the illness. While in route, he met Ginger Morgan at the Humane Society in Memphis. Morgan, executive director of 2 Million Dogs, opened the local headquarters of the organization in Cooper-Young in 2008. 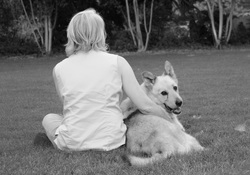 “I have lost several people to cancer and three dogs to cancer since 2011. It’s not something that is going to go away unless people are made aware,” Morgan said. The organization’s slogan is “Cancer touches everyone.” The disease affects cats and dogs in the same way that it affects humans. “Losing a pet can hurt just as badly as losing a family member. It’s good to know that someone is working to save all of us,” said Overton Park regular Sarah Grace Glover. Currently 2 Million Dogs is funding research for a study at Princeton University. The research will study the progression of breast cancer. Because four legged friends have 10 mammary glands and are exposed to the same elements as humans, they make the best test subjects. An ultimate result can be seen quicker due to their short life spans. To raise funds for the study known as comparative oncology, 2 Million Dogs organizes Puppy-Up! walks throughout the country, hosts a memorial wall on its website, sells merchandise online and accepts donations. The Puppy-Up! walks have been the most effective. To participate, people can sign up online and pay a $20 fee. Once at the walk, participants are greeted by a human hero and a canine hero. They can listen to live music, play games and receive information on the early warning signs of cancer in companion pets. After all have gathered, people and dogs will Puppy-Up! and walk two miles. The next event is scheduled in Madison, Wis. on May 4. For those wanting to support the 2 Million Dogs, attend a walk, volunteer, donate, or plan an event yourself. Instructions can be found online . “As long as people are made aware if the signs, I’m a happy camper,” Morgan said.